With the rapid evolution and development of digital technology in photography in the early 2000's, digital cameras have become more and more accessible to the masses. Digital photography, once scoffed by conservative film buffs to be 'never able to duplicate the quality of silver bromide prints', has taken the world by storm. With the introduction of smart phones, practically everyone now has a camera in his pocket or handbag. The availability of competitively-priced digital cameras has also changed the landscape in nature photography. Today, there are probably hundreds of millions of nature photographs being featured on the internet, social media and all other forms of digital and print technology. Even within nature photography, there are numerous genres, focusing on a whole spectrum of subjects from landscape and animal to bird and macro photography. Each specialised genre requires dedicated equipment like the camera body, lenses, flash and all sorts of ancillary accessories that come with the nature subject of choice. Besides the ever-popular bird photography, macro and insect photography has a steadily increasing following all over the world. Butterfly photography has also caught on, and there are many groups of photographers who dedicate their free time and weekends to shooting just butterflies as their primary nature subject of choice. Shooting butterflies can be an extremely challenging but rewarding past time for photographers. 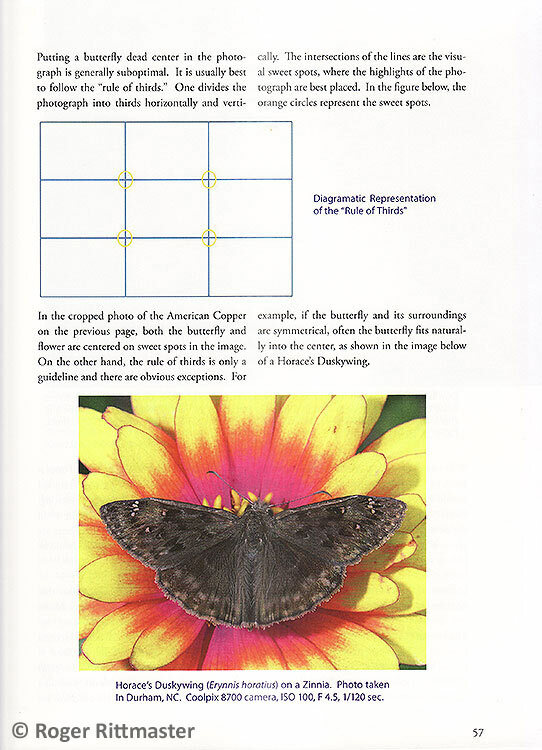 Some basic understanding of photographic equipment and about butterflies would be needed as a primer to starting butterfly photography. 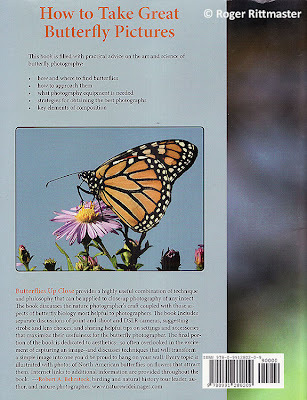 Other than learning from scratch and bringing your camera out in the field, one can also turn to books to teach them some basic skills and techniques in butterfly photography. 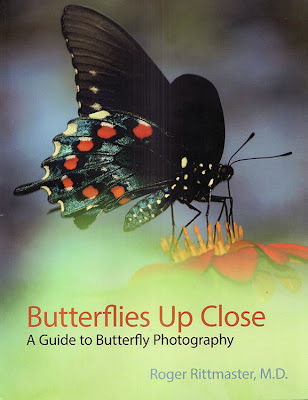 A good example of such a book is the recently launched "Butterflies Up Close : A Guide to Butterfly Photography" by Dr Roger Rittmaster. I had the good fortune of meeting Roger when he was in Singapore some years back, and we went on a butterfly photography outing in Singapore. It was a great day out together, as we compared notes and shared techniques on butterfly photography. Now in 2014, Roger has launched his book on butterfly photography. 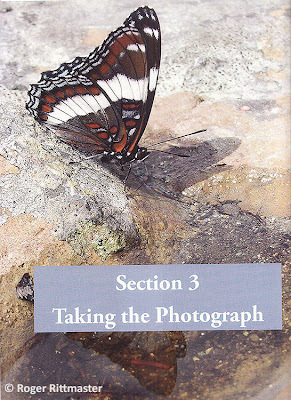 Featuring butterflies from North America, his book is a breeze to read, and is organised into three very clear sections that provide a concise and easy-to-understand writing style for all budding butterfly photographers. 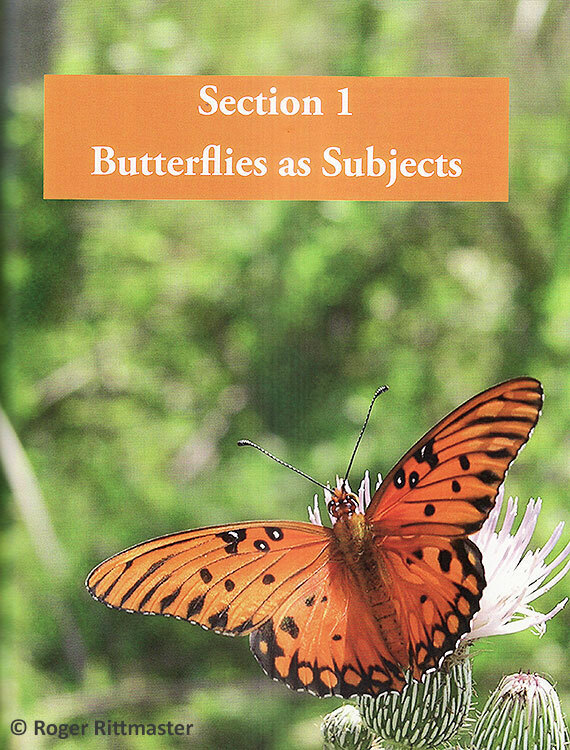 The first section deals with butterflies as subjects and Roger shares his knowledge and resources about butterflies in general, habitats where they can be found (again, mainly for the US context), identification, natural history, how to attract them to your own backyard and so on. 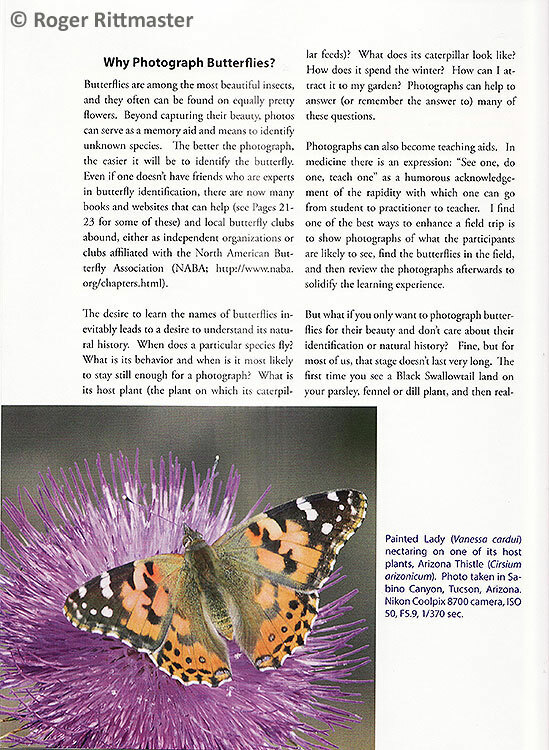 I particularly liked Roger's advice on butterfly photography etiquette! Butterflies, being rather small and skittish subjects, require a lot of patience and stalking before one can get a good opportunity to photograph them. Often when in a group, overzealous newbies may get in the way of others and frustrating the efforts of their friends who are trying to stalk a skittish subject. So it is a timely reminder to exercise restraint, respect and due consideration for others when out photographing butterflies in a group. This entire section discusses how, through butterfly photography, one will begin to appreciate butterflies, their amazing diversity of colours, shapes, behaviour, life history, survival in the wild and so on, and in the process, learn a lot more about butterflies than merely reading a science book about them. Roger also shares some web resources in the US where readers can look to, for butterfly identification and specialist groups where interested readers can go to learn more about butterflies. 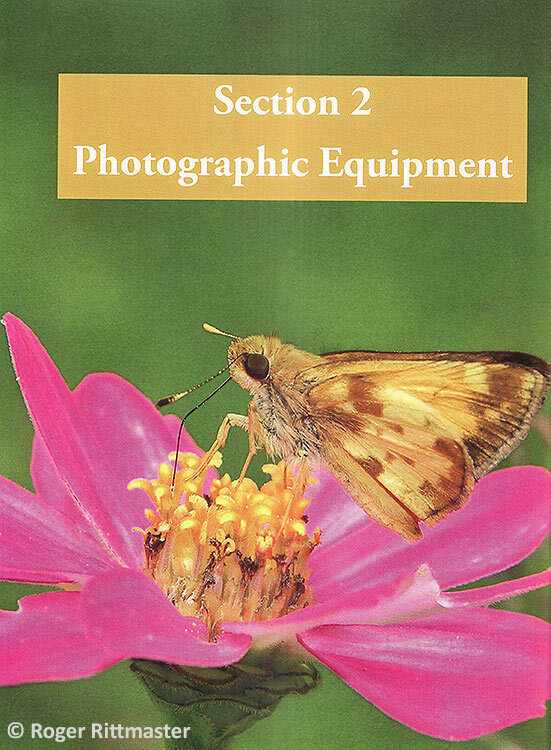 In Section 2, Roger shares his experience on the photographic equipment that he has personally used in his years of photographing butterflies, and the pros and cons of various systems (like how deep your pockets should be, when picking up this hobby!). There are advantages of using a simple Point-and-Shoot (P&S) camera system, from the swivel LCD screen that can be used for shooting butterflies perched in awkward positions, to the large depth of field of the smaller sensors that will almost ensure tack sharp shots of the butterflies and everything else in the frame! 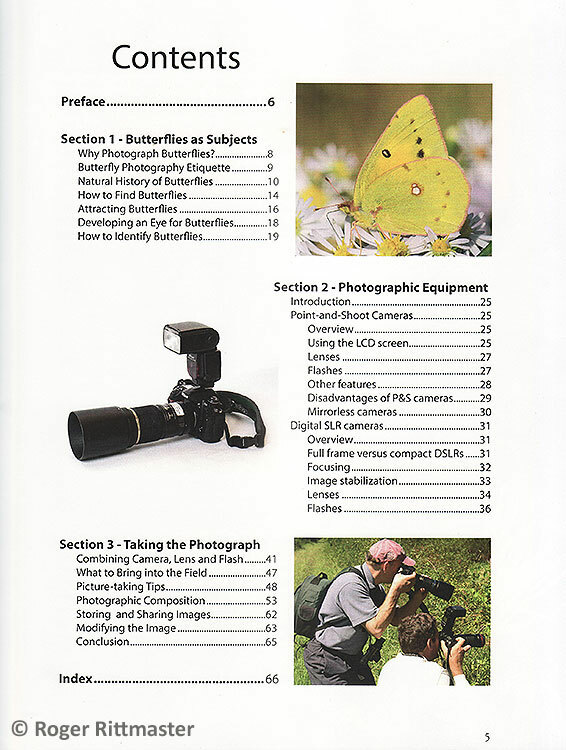 The rest of the section deals with camera systems, lenses, flashes, focusing, image stabilisation and other basic information that a newcomer to butterfly photography may want to consider, before investing his hard-earned salary on his preferred photographic equipment. The final section of the book deals with going out in the field and taking the photo. In Section 3, aptly sub-titled "Taking the Photograph", Roger summarises the information in the two preceding sections and takes the reader right out into the field and to start practising the techniques of photographing butterflies. I'm glad that Roger shares the opinion that the majority of ButterflyCircle members also agree with - that the Tamron 180mm f/3.5 SP macro lens is one of the best butterfly-shooting lenses there is out there today. 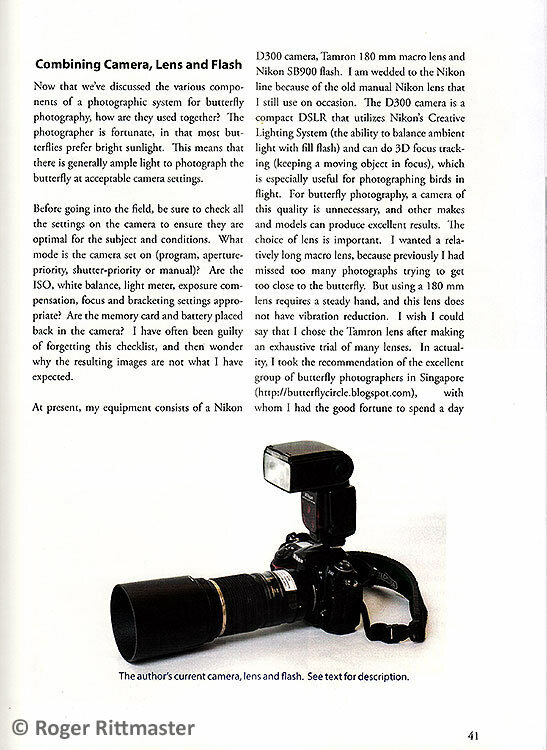 Despite the lens' shortcomings of having a slow AF and no image stabilisation, some of ButterflyCircle's best works (and from the book, I can also see that Roger's own best works too) are taken with this lens. 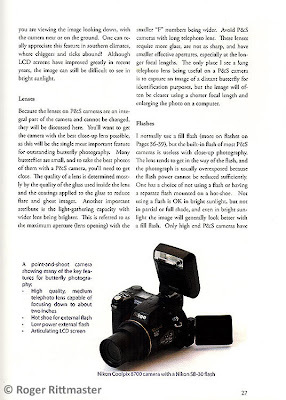 The discussion on the technical aspects of camera settings - like AF, Rear Synch Flash, Metering and so on, are useful tips that Roger shares in this section. 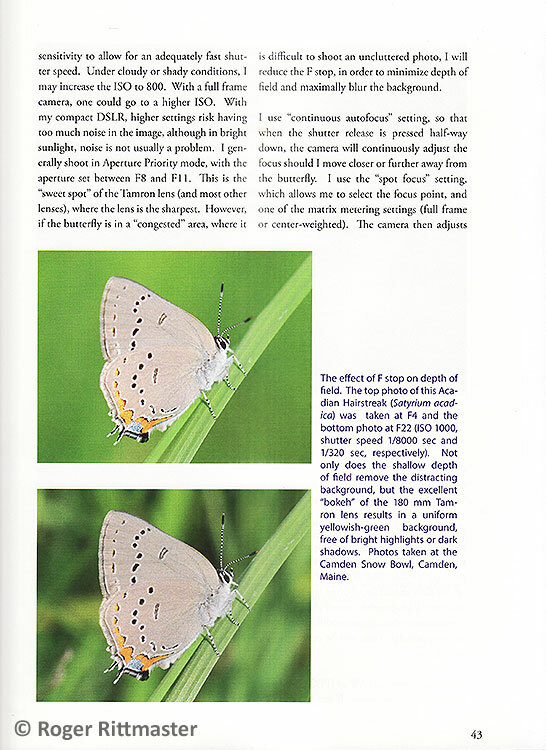 As would most regular butterfly photographers would already be aware of, Roger also shares the opinion that carrying a tripod for butterfly photography is more of a hindrance than an advantage. It would be more effective to select an appropriate ISO for the lighting conditions and then practising one's handholding and breathing techniques to minimise motion blur when shooting at low shutter speeds. 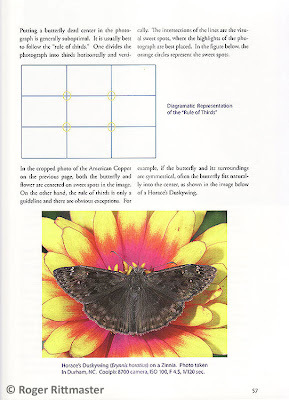 The basic rules of composition are also discussed, and the fundamental guide of using the classic "rule of thirds" makes composing the subject much easier to understand. Roger also shares his tips on stalking a butterfly subject, understanding how the butterfly behaves in various situations, before approaching stealthily for a shot without spooking the butterfly off. This section also deals with how the background of a shot can be managed using the correct aperture so that the subject stands out without a messy background. Some basic post-processing techniques, which are almost as important as taking the photograph itself, are elaborated. In digital photography, a photographer will also very quickly learn that spending time in front of a computer will pay good dividends in getting a perfect photograph at times. Manipulating a shot on the computer can sometimes save an underexposed or overexposed shot which may yield an acceptable output that would have otherwise been destined for the trash folder. 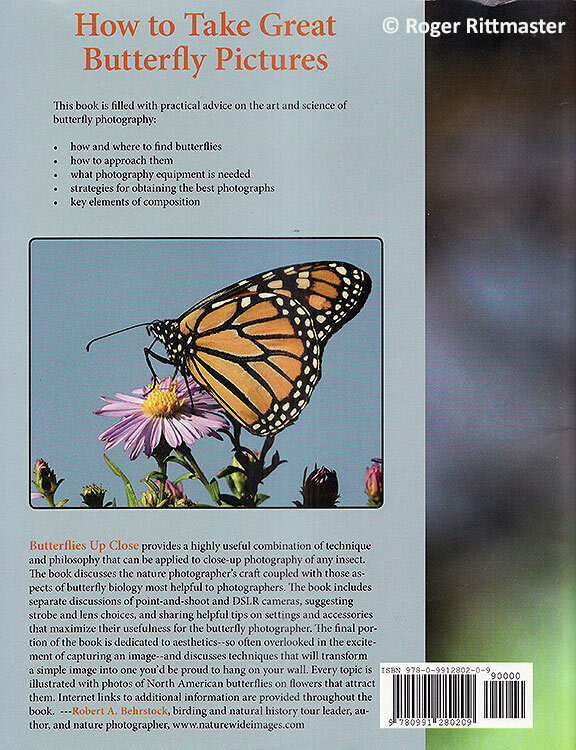 All in all, Roger did a great piece of work in this book, and it would be a great help to those who are just starting out to appreciate butterflies and venturing into the realm of butterfly photography. I would also like to thank Roger for acknowledging ButterflyCircle in his book and for generously sending a copy of his book to me when it was launched. Text by Khew SK : Scans of "Butterflies Up Close", courtesy of Dr Roger Rittmaster.